FCA expects the transition to natural gas to slash the company's annual fuel costs by 35 percent, or about $2.5 million. Fiat Chrysler has invested $40 million to convert 179 trucks that transport parts between plants in the U.S. and Canada to run on compressed natural gas rather than diesel. The investment, unveiled Friday, includes $1.8 million in infrastructure upgrades at FCA’s transport maintenance facility in Detroit and the construction of a $5 million compressed natural gas fueling station. It will become the largest private station of its kind in North America, the company said. “We wouldn’t make that kind of investment of that magnitude if first and foremost it didn’t have a solid business case,” said Steve Beahm, FCA North American supply chain chief. “The change over to diesel to natural gas provides significant benefits to reducing greenhouse gas emissions and dependence on foreign oil. FCA expects the transition to natural gas to slash the company’s annual fuel costs by 35 percent, or about $2.5 million. The company’s truck fleet, which transports auto parts between plants in Michigan, Indiana, Ohio and Ontario, consumed about 2.6 million gallons of diesel fuel per year at a cost of $7.2 million. “This is a major change in the way we operate,” said Marty DiFiore, the head of FCA Transport. The conversion to natural gas took place over two years. The company’s fleet drivers and skilled trades workers went through “extensive training” to learn how to operate and maintain the trucks, DiFiore said. 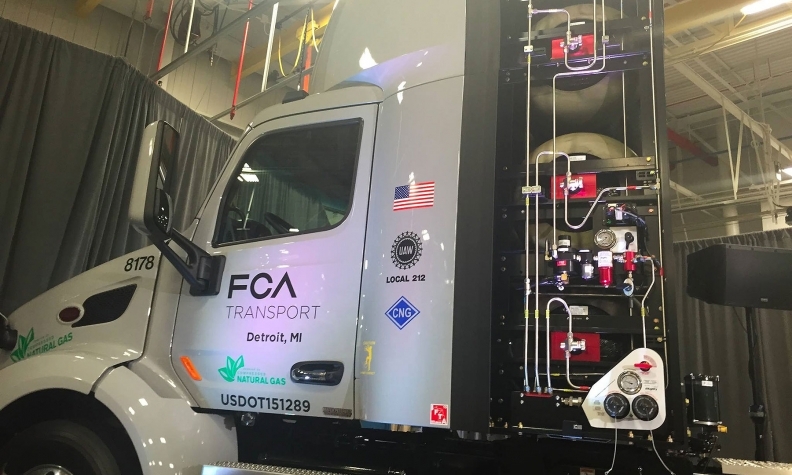 FCA trucks, which have been in service for six months, are now equipped with fuel tanks that have capacity for a 640-mile trip, allowing drivers to travel from a transport hub in Detroit to any other facility, and return without having to refuel. 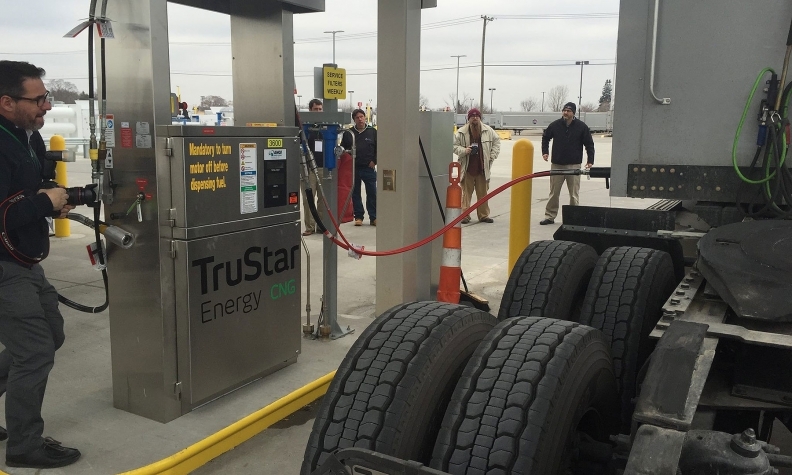 The trucks, which have been in service for six months, are equipped with fuel tanks that have capacity for a 640-mile trip, allowing drivers to travel from the transport hub in Detroit to any other facility, and return without having to refuel. Fiat Chrysler said the change to natural gas will reduce the company’s carbon dioxide emissions by 16,000 tons per year, or about the same amount emitted to power 1,500 homes. Matthew Godlewski, president of Natural Gas Vehicles for America, said FCA joined “an elite and influential group of companies” such as AT&T Inc., Waste Management Inc. and UPS Inc., in converting its fleet to compressed natural gas. The average price for diesel fuel in the U.S. this week declined to $2.42 per gallon from $1.18 cents from a year earlier, government data show. Despite that, Godlewski said the relative stability of natural gas prices compared with petroleum, in addition to its abundance and environmental benefits, makes it an attractive fuel source for FCA and others to use.